Hey there Real Life English! We have for you today another post about discourse markers, following our articles about the words:like, actually and mean. If you remember, discourse markers are used to coat what you are saying and add extra flavor to your speech, kind of like sprinkles on top of an ice cream cone. As we’ve seen in the past, simple little words often have many different meanings and are useful in a wide range of situations. Aside from its meaning of “currently,” the word now has many other uses in spoken language. It can be used to clarify, express confusion, talk about the next step, show appreciation and get peoples attention. 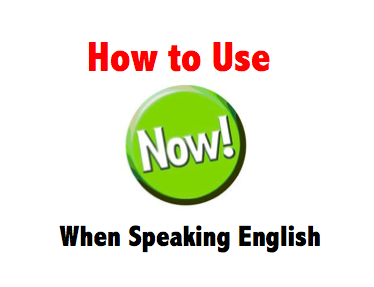 Its uses are quite varied as you can see, so let’s get down to business and learn how to use now in speech. One of the first words you learned when you started studying English was the word now. Back in those days you were taught that now means “currently.” This still holds true, but now you are going to learn some more uses for it. When expressing and you feel there is some confusion about what you are saying, you use now at the beginning of your sentence to signify that you are going to clarify. Putting now at the beginning of your sentence allows you time to think about what you are going to say next. Someone just said something to you and you aren’t quite sure you understand what they meant. This is the ideal situation for you to start your response with “now.” In this way, now is used to signal to the other person that you are confused. Your friend just presented a brilliant idea to you, and you want to carry out the next step, so you tell him what has to come next. To do this, you preface your next sentence with now. Let’s say for example that a really nice car passes by, or during conversation someone mentions a public figure that you appreciate. In these cases you want to express your appreciation of these things, so you give them praise. But you don’t just give praise, you preface your sentence with now in order to reinforce your praise. Now pay attention because I’m going to introduce the last way that now is used in speech. When you want to add extra emphasis to let people know that they should be paying attention, now is added at the beginning of the sentence to accomplish this. Now, I want to point out here that when using now, stress and intonation are very important in order to make sure you are understood correctly. In order to learn the proper intonation you need to hear it being used by native speakers in real life situations. In the future Real Life English plans on making videos to teach how to properly pronounce and use words like now. If you would like to be alerted when these videos are made, sign up for our mailing list at the bottom of this post.